How do you want to run the console? When we say we offer real-time protection, we mean it: we deliver more than 200 signature updates per day (approximately one every six minutes) that update your Virus Definitions to keep you protected against the latest, emerging malware threats. Best of all, thanks to our cloud-based security, these micro-updates won’t ever slow you down. Avast utilizes cloud-based technology to ensure that most of the processing it needs to protect your business is done over the cloud. 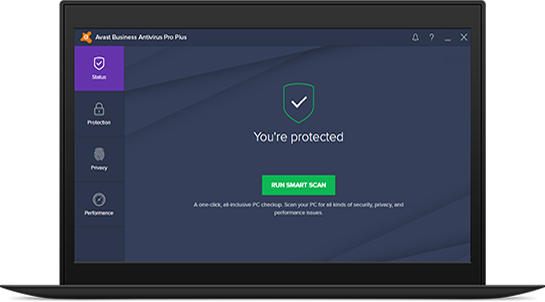 By only using your PC or Server’s processors for what is absolutely necessary, Avast is able to keep you safe without getting in your way or slowing you down. Be focused on your business without any interruption. The Antivirus will do its job silently on the background. Real-time protection that secures the most essential, vulnerable parts of your PC. Web shield scans websites and downloaded files for any malware trying to sneak onto your system, Mail shield checks emails received to ensure they’re free from any dangerous links or attachments, while File shield quickly scans files that are launched on a PC to ensure they’re not a threat to you or your data. You take your work with you, but when you want to connect on the go, you might not always find the most secure wi-fi. But since business can’t wait, Avast SecureLine VPN makes any connection private by hiding your presence online, so no malicious hackers can see where you go, what you do, or spy on you while you’re online. Potential Unwanted Programs (PUPs), such as toolbars and advertising networks that a user installs unwittingly can not only slow down a PC, but also give your data away to third-party advertisers. Avast Browser Cleanup scans your browsers, identifies all poorly rated add-ons, extensions, search engines and toolbars and makes it easy for you to disable or remove tham. Otherwise known as whitelisting, Hardened Mode starts blocking files from executing when it’s uncertain whether the application is safe or not. But if that’s not good enough, you can switch it to “Aggressive” mode and Hardened mode will also stop any applications which aren’t trusted by our 400 million users. As HTTPS websites become more common, malware producers are finding ways to slip their product into even these protected pages. HTTPS scanning detects and decrypts TLS/SSL-protected traffic. Additionally, this feature adds compatibility for SPDY+HTTPS/HTTP 2.0 traffic, without replacing the security certificate the website uses. Or, in summation, we’re able to check HTTPS sites without disrupting your browsing experience. Some types of malware are undetectable by standard antivirus scans, and can stay hidden as long as the operating system is running. Boot-time scan is an advanced feature which lets you scan for any deeply entrenched malware and remove them before the operating system or other services start running, so they have nothing to hide behind. Cybercriminals take advantage of vulnerabilities in outdated, commonly used software such as browsers, Flash Player, Skype and more. Using these vulnerabilities, they can access a user’s system to install malware which can affect performance and, more critically, lead to identity theft. Therefore Avast provides automatic updates of your applications so you can enjoy the most up-to-date programs conveniently and easily. It might be convenient to save your passwords on your browser, but that leaves them vulnerable to hackers who can steal them to access your accounts. That’s why Avast Passwords provides easy, secured storage for all your login information in one place, locked behind your master password. All the convenience, without the compromise.